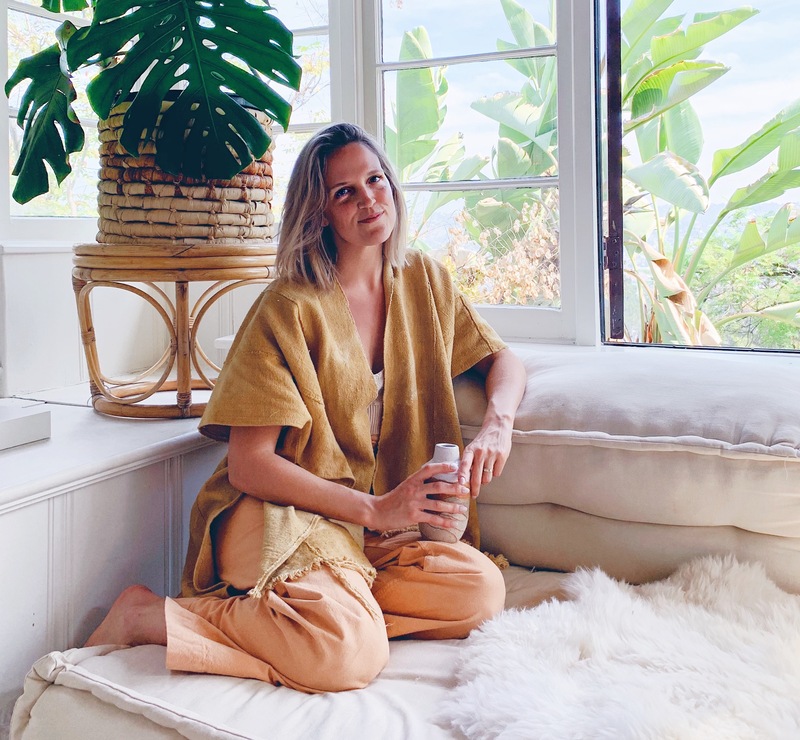 With so much devastation the world over and days that feel oppressive and discouraging, I always turn to food to lift my spirits, nourish my body and reconnect with those I love. In these trying times, we need each other more than ever. As fall approaches, I’m planning to re-start up a supper club with some friends that we put on hold for the summer. Now is a good time to gather around the table, have engaging conversations and be grateful for all we do have. Together is the only way we can heal. I don’t know about you, but I’m always looking for healthy brunch ideas. And I love hosting my friends for brunch. I used to love going out, but afterward I would always feel tired, sluggish, overly full and ready for a nap. These days, I favor brunching at home and keeping it on the lighter side. This recipe is so freaking good, easy to make and healthy. Made with Stahlbush Island Farms Cauliflower Crumbles, this recipe is relatively quick to make except for the tomatoes, but those can be made ahead if you prefer. 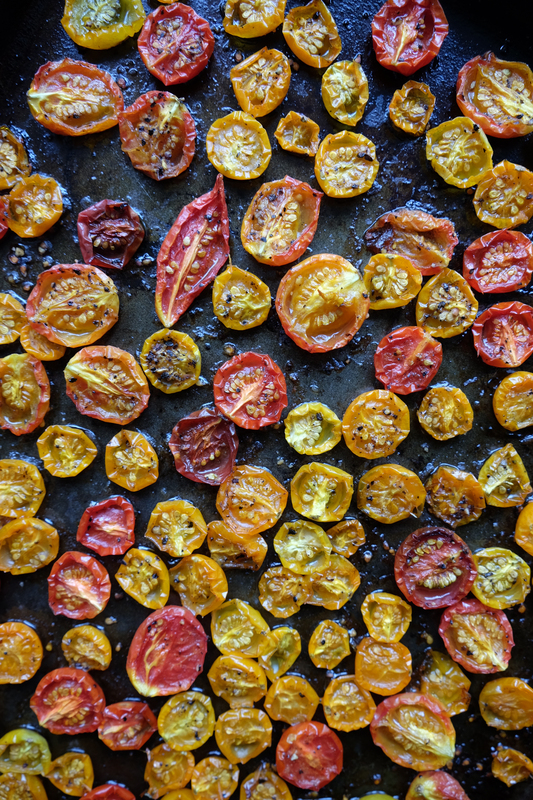 Roasted tomatoes are some of my favorite end-of-summer treats. They are sweet little gems that burst with flavor. I love adding them to just about any meal I prepare. You can roast a couple pints at a time and keep a container full in your refrigerator to use throughout the week. My favorite variety of tomatoes are sun gold (the yellow ones), so if those are available to you, I’d definitely recommend those. 1.) Preheat oven to 250°. Halve tomatoes, toss in oil, salt and pepper. On a rimmed baking sheet, spread the tomatoes with the seeds facing up. Roast in the oven for 90-115 minutes. Tomatoes should be shriveled a bit and slightly golden in some areas. Once they’re done, remove from oven and set aside. 2.) Preheat oven to 350°. In a heavy-bottomed skillet that is oven safe, heat 2 Tablespoons oil over medium heat. Add cauliflower crumbles and sauté for 2-3 minutes stirring occasionally until cauliflower is mostly unfrozen. Cover pan with a lid and let cauliflower steam for another 3-5 minutes or until tender but not mushy. 3.) While cauliflower is cooking, prep the herbs. Once cauliflower is done, remove lid from pan, turn heat to low and throughly mix in the herbs, salt and pepper. 4.) Spread the cauliflower mixture so it’s even in the pan. Turn heat off. Create 6 holes and drizzle a bit of oil in each one. Crack one egg into each hole. Bake skillet in the preheated oven for 10-13 minutes or until egg whites are set. 5.) 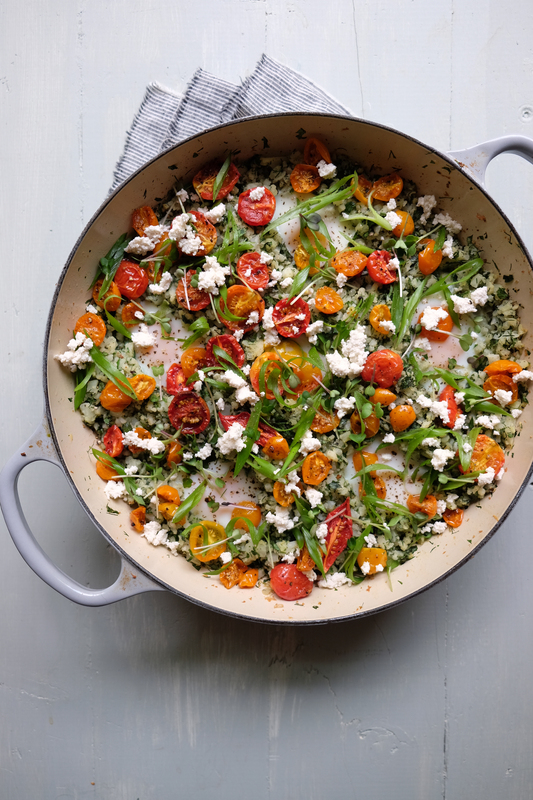 Remove skillet from oven, top with roasted tomatoes and desired garnishes. Serve immediately. Enjoy! 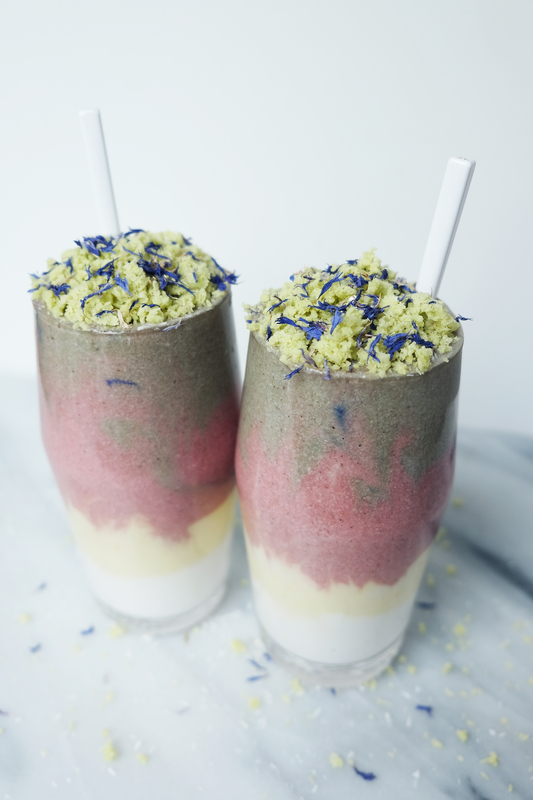 Spring-Inspired Layered Smoothie + A Giveaway! To enter, must be following @alison__wu, @vitamix, @shopmazama, @amazinggrass and @mountainroseherbs on Instagram. Then simply leave a comment below on this blog post telling me what would be in your dream smoothie. Contest open to US residents only. Winner announced May 9, 2017. 1.) In a high-speed blender, blend bananas, zucchini, coconut butter, collagen/protein powder, coconut yogurt, almond mylk and adaptogens (if using) until smooth. Divide between 3 bowls. 2.) 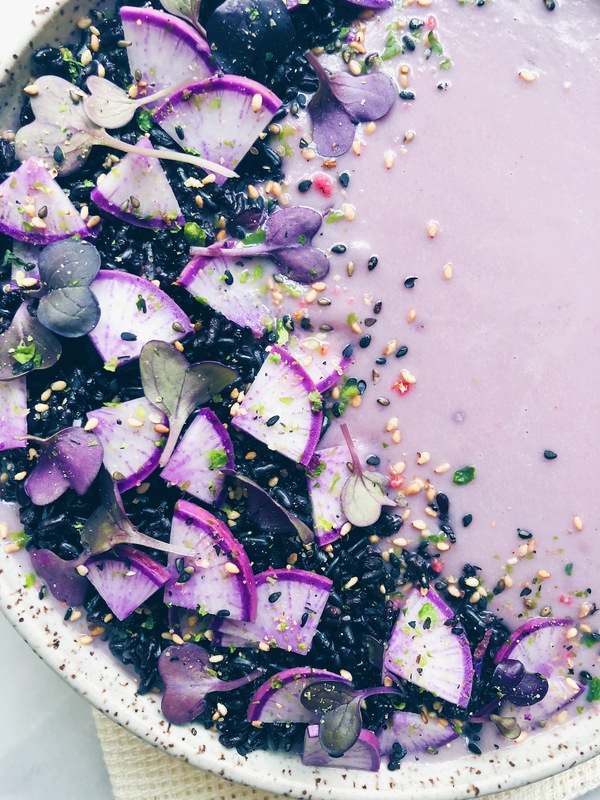 To make the greyish layer, blend contents of 1 bowl, blue algae powder and blackberries until well combined. Pour into bowl and set aside. 3.) To make yellow layer, blend contents of 1 bowl, freeze dried mango and turmeric until well combined. Pour into bowl and set aside. 4.) 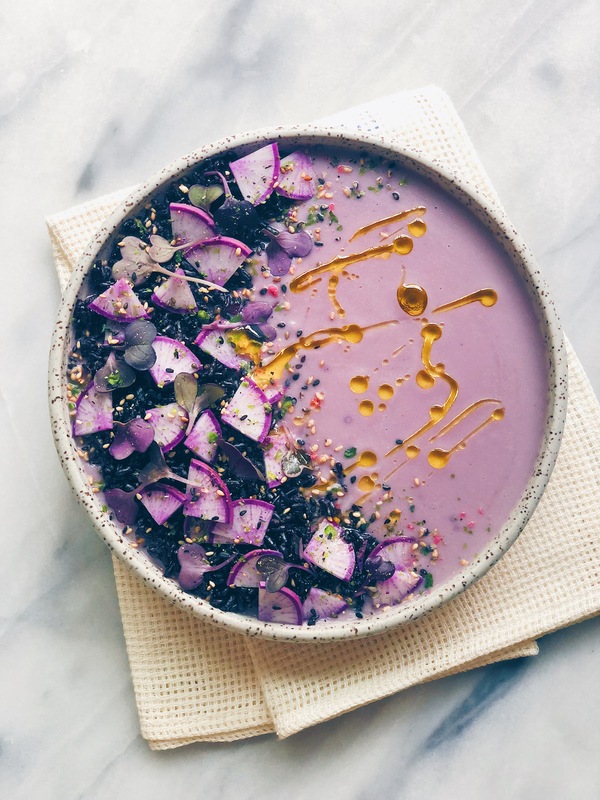 To make pink layer, blend contents of 1 bowl and pitaya powder or beet until well combined. Pour into bowl and set aside. 5.) Using a spoon layer some coconut yogurt on the bottom of your glasses then do the same with the yellow, pink and greyish layers. If you want a tie dye affect, use a chopstick to swirl the smoothie against the glass. Top with garnishes and enjoy! Just wrapping up an incredible week in LA. Met so many new people, enjoyed the sunshine and got some relaxing time alone. I love this city so much. My hope is that I can come back multiple times a year and be working with brands down here regularly. Anyways, this Papapya Colada Smoothie is dedicated to my time spent in LA. Just looking at it reminds me of the warmth and sunshine I experienced while I was here, both literally and metaphorically. This cauliflower-based smoothie is just the right amount of sweet, creamy and delicious. 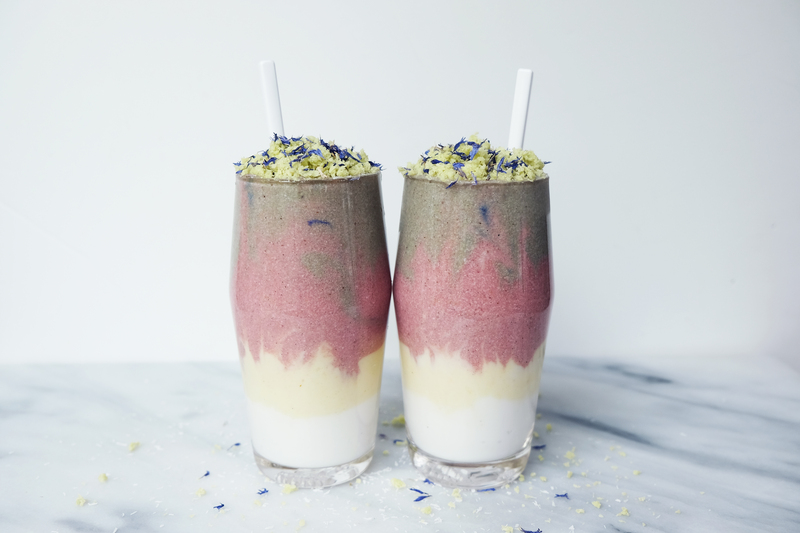 I know you’re probably thinking, “cauliflower-based smoothie?! ?”, but I promise you it’s so good and you can’t even taste the cauli. Packed with healthy fats and fiber, this smoothie is a great choice to start your day with. I also love that I feel like I’m drinking a piña colada without the alcohol and excessive amount of sugar. 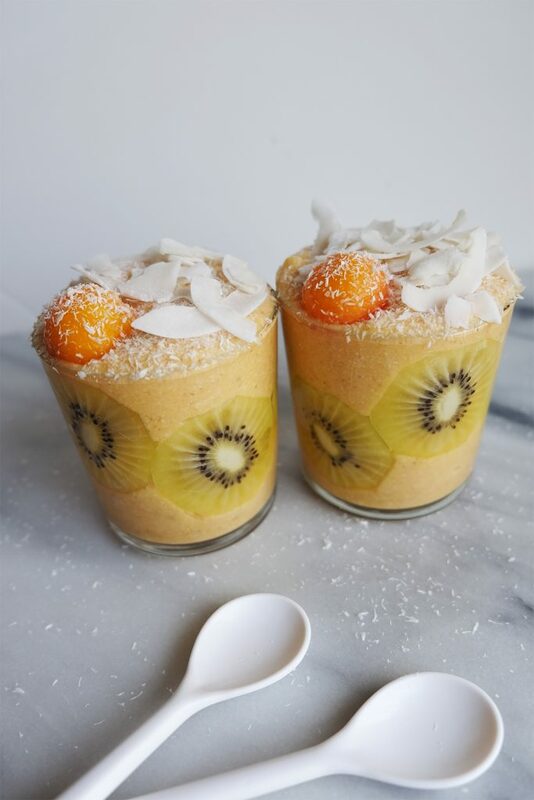 Make this smoothie, find some sunshine and drink up! 1.) Blend all ingredients in a high-speed blender for 45-60 seconds until smooth. 2.) Thinly slice kiwi. Press kiwi slices against the sides of 2 dry glasses. 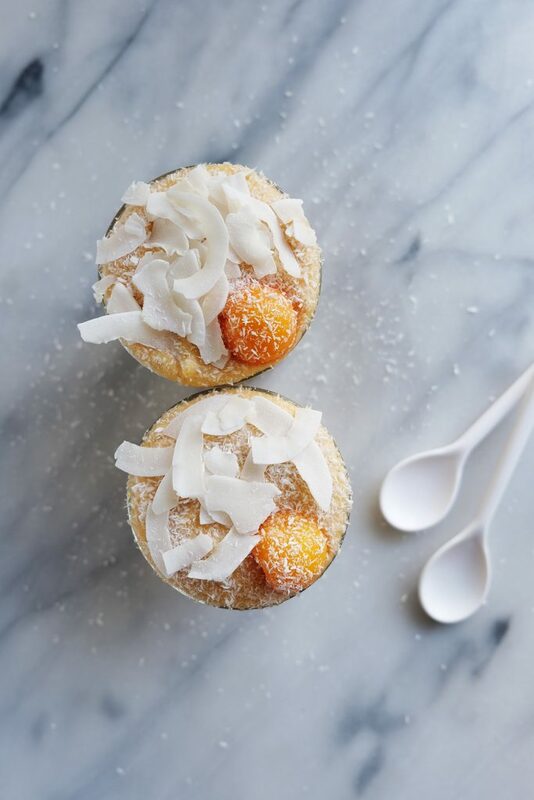 Pour contents of the blender evenly between both glasses, top with dried coconut and a papaya ball and serve immediately. Enjoy! 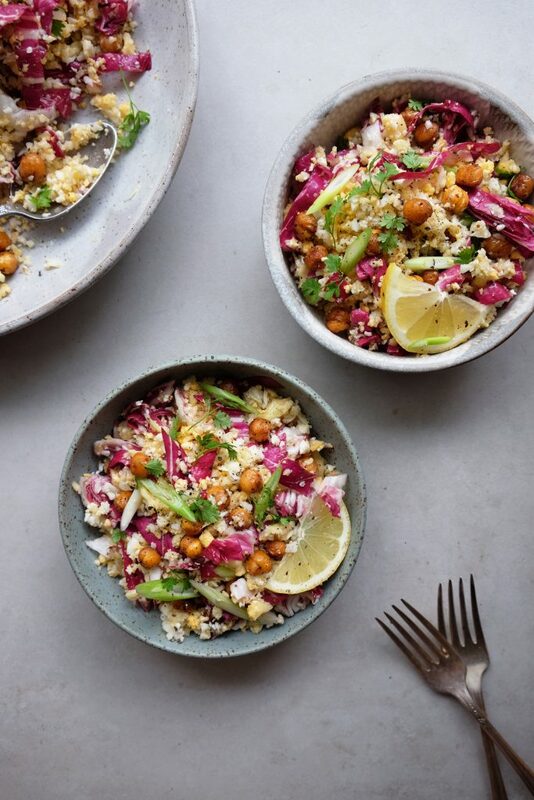 This cauli salad is SO simple yet so satisfying. Over here at Wu Haus, we eat this salad as a main course for dinner, but it would also make a lovely side dish or starter salad. I can especially imagine it served with a delicious piece of baked salmon. Chervil is a new herb to me. It’s a close relative to parsley. I found it at the farmers market here in Portland and thought I would give it a try. I love parsley and think it’s one of the most underused ingredients in the kitchen. 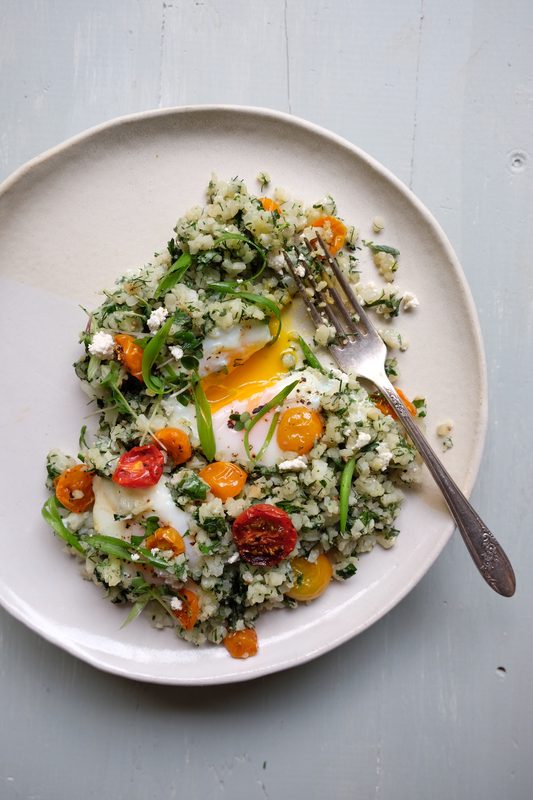 Parsley, and even more so, chervil, is really a food stylists’ dream. It’s light and delicate and adds movement to any dish. For this salad, I used a mix of regular white cauliflower and yellow cauliflower. I love the pop of color the yellow adds to the color palette. I bet it would also be gorgeous with purple cauliflower. 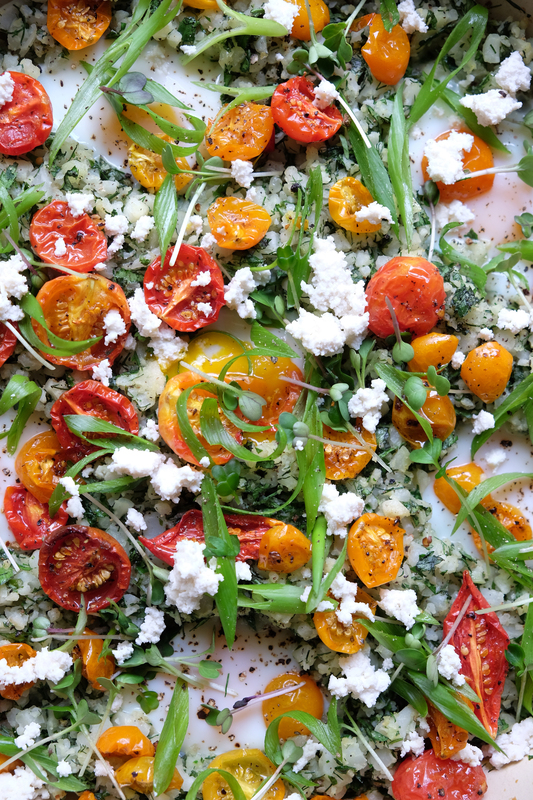 This salad really makes me yearn for spring. The brightness of the color and flavor palettes reminds me that the change of season is right around the corner. I’m so looking forward to all the fresh produce that will soon be at the farmers market. Only a few more weeks now! 3.) Make the dressing by vigorously whisking together all ingredients until smooth. 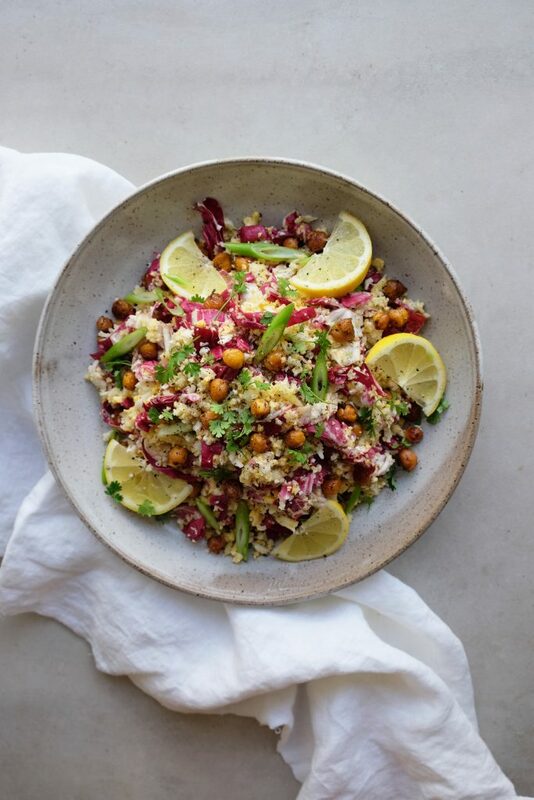 Toss the cauliflower, radicchio, chervil or parsley and scallions with the dressing until well coated. Add the chickpeas and lightly toss. Add more salt and pepper, if desired. If possible, allow to sit for 30 -60 minutes to let the cauliflower absorb the flavors. Garnish with extra chervil or parsley, lemon slices and avocado (optional). Enjoy! I wasn’t originally planning to post this recipe, but many of you reached out to me asking for it, so here it is! Super simple, healthy and delicious. The key to the crust is to be sure to squeeze out as much water as possible from the cauliflower before making the dough. I use a nut mylk bag, but a clean dish cloth or cheese cloth would work too. Something to keep in mind: This won’t be like a traditional pizza crust, but it’s still amazingly delicious. If you’re looking for something more traditional, Bob’s Red Mill makes a great gluten-free pizza crust mix that can be made vegan. Oh! And another amazing thing about this pizza is this vegan cashew- and coconut-based cheeze that melts and browns from Miyoko’s Kitchen. It’s seriously so good. I didn’t think I could be so impressed with a vegan melting cheeze. I haven’t had the chance to try any of their other products, but if you have, I would love to know what you think. 1.) Preheat oven to 450° with pizza stone if using. 2.) Whisk together ground flax and water until well combined. Allow to chill in the refrigerator for about 20 minutes. 3.) Steam cauliflower florets until tender. Drain from water and rinse with cold water. 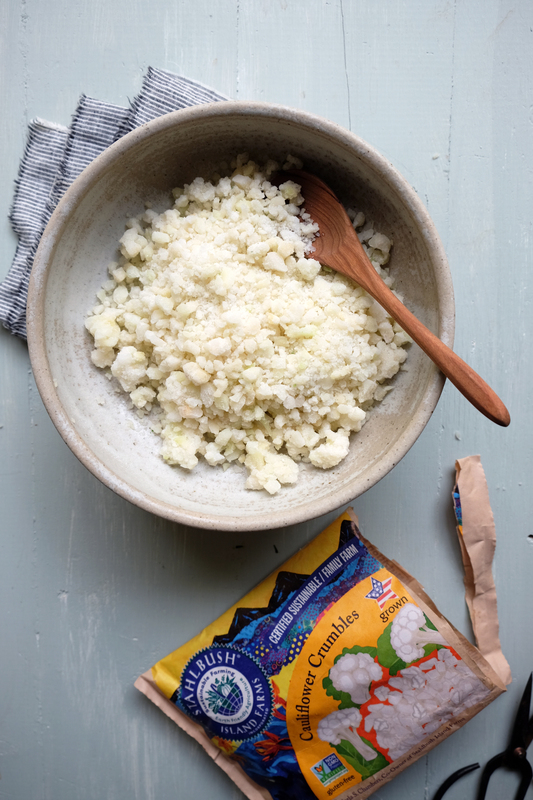 Place florets in nut mylk bag, dish towel or cheesecloth, and squeeze out as much water as possible from cauliflower. 4.) Transfer drained cauliflower to a large bowl. Using a potato masher or fork, mash cauliflower to desired consistency. You could also use a food processor or high-speed blender if you want a finer texture. 5.) Add nut flour or almond meal, flax mixture, herbs, salt and pepper to cauliflower. Using a rubber spatula, mix until well combined and a ball of dough forms easily. 6.) Roll out dough between 2 sheets of parchment paper to about 2/3″ thickness. Transfer rolled out dough to a pizza stone or to a parchment-lined baking sheet. Bake in preheated oven for 25 minutes until dough is lightly browned. 7.) After par-baking, top pizza with sauce and your favorite toppings. Bake for an additional 10-12 minutes, and enjoy! These last couple of days have felt so surreal. I’ve been feeling a spectrum of emotions. Yesterday was especially difficult. Today, I’m trying to take a step back from all the emotions and focus on actionable change. What can I do to help my local, national and global community? For starters, I set up monthly payments of $10 to both Planned Parenthood, Environmental Defense Fund and the ACLU. It’s only $30 a month, but think about what a difference that would make if everyone donated even just $5 a month. I know we are all working our asses off and so many people struggling to make ends meet, but these organizations need us more than ever right now. This is where I chose to start. In the days ahead, more participation, energy and commitment will be needed. Today, I’m also focusing on how many amazing, passionate, caring, loving and kind people there are in the world that are dedicated to progressive change. This is no time to wallow in our sadness. Now more than ever, we must be strong together. One of my favorite things about food is its ability to bring us together. My other favorite thing about food is its ability to offer comfort, warmth and nourishment. All things we need right now. I hope this recipe brings you even the smallest sense of warmth. Share and enjoy it with your friends, family and neighbors. 1.) Blend all ingredients except for the red chili flakes in a high-speed blender until desired consistency. Note: I like mine smooth but still chunky. That sweet spot in the middle. 1.) Preheat the oven to 400°. Toss the cauliflower and garlic in the avocado oil. Season with salt and pepper. 2.) Spread the cauliflower and garlic on a lined baking sheet. Place the lemon slices and fresh thyme evenly over the baking sheet. 3.) Roast in the oven for 25-30 minutes until cauliflower is golden brown and tender-crisp. 1.) In a medium-size pot or dutch oven, bring water and 1 teaspoon salt to a boil. Gradually stir in polenta. Reduce heat to low and simmer gently, making sure to stir frequently to prevent sticking. Towards the end of cooking melt in the butter/non-dairy margarine, if using, and season with salt and pepper. 1.) Spread a generous amount (2-3 Tablespoons) of the romesco down on a bowl or plate. Scoop a serving of the polenta next to the romesco. Top with the roasted cauliflower and garlic, and garnish with fresh Italian parsley. Serve immediately.